It’s easy to substitute Rice Chex in place of the gluten-free crackers (and less expensive)! Put Rice Chex in a plastic zipper bag and roll with a rolling pin until crumb-like. I also use regular mustard instead of Dijon mustard and Italian Seasoning instead of sage. Double the recipe to make 2 loaves and freeze one for later or save the extra 1 1/2 pounds of ground turkey for tacos or hamburgers. 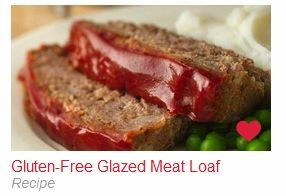 You could also bake mini meatloaves in muffin tins or mini loaf pans and freeze them for single-serve meals. If you choose to buy the 16-20 ounce packages of ground turkey, just use a little bit less of each ingredient since the recipe calls for 1 1/2 lbs.